What began as a roughly quarter-acre brush fire spread to a large Mormon church in Glassell Park Tuesday, engulfing the building’s attic then quickly gutting a major portion of the structure. The brush fire was initially reported at 2:38 p.m. at the Glendale (2) Freeway and North Verdugo Road, according to Margaret Stewart of the Los Angeles Fire Department. 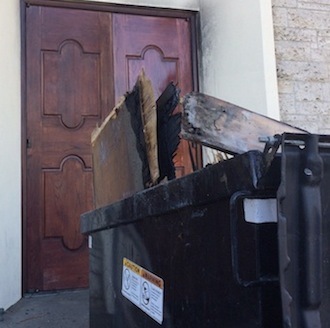 The fire spread to the eaves of the Church of Jesus Christ of Latter-day Saints at 3845 Fletcher Drive, and while firefighters initially appeared to have knocked back the flames, the blaze erupted in the building’s attic, sending heavy black smoke over the area. Flames then burned through the roof, a portion of which collapsed and sent firefighters scrambling for ladders to get off the top of the structure. Fire crews then went into a defensive mode, hoping to drown the fire. Some flames spread to nearby palm trees. At least one firefighter was being treated for unspecified injuries. More than 100 firefighters were sent to the scene. A pair of water-dropping helicopters were also initially sent to battle the blaze. Two lanes of the southbound 2 Freeway were closed while fire crews battled the blaze.